Amsterdam by Night is one of the main projects of WiW Photography. The photos offer a refreshing view on the rich history of the capital of the Netherlands. 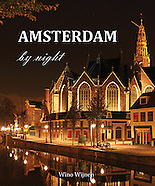 The project has resulted in the publication of "Amsterdam by Night", a book that tells the rich history of Amsterdam in more than 100 nightphotos. Visit www.amsterdambynight.net for more nightly Amsterdam. This is the complete "Amsterdam by Night" gallery. All photos are available as high quality prints. Feel free to look around! More information can be found at www.amsterdambynight.net Inquire about licensing options via the contact page.